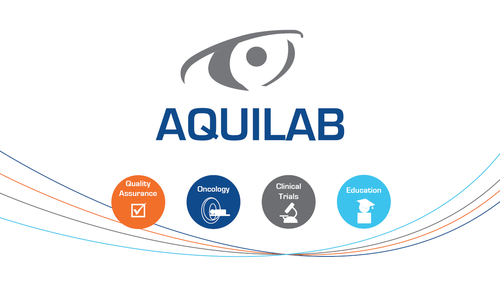 AQUILAB is a French SME which develops advanced solutions for quality assurance of medical imaging and radiotherapy equipment (CT, MRI, Nuclear Medicine, Radiology…) and for quality improvement in radiotherapy treatment. More than 250 clinics in France and outside use Aquilabs products, including the most advanced radiotherapy centers in France. AQUILAB has become a benchmark in the market of quality assurance for medical imaging and is rapidly growing in the preparation and evaluation of radiotherapy treatment market. Over 18 years, AQUILAB has built an expertise in offering products at the heart of the medical issues with an important scientific experiment. We have it at heart to ensure Quality of medical equipments, Quality in radiotherapy treatments, Quality in exchanges between health professionals. Because our products are dedicated to improvement quality in facilities and medical practices, AQUILAB gives much attention to the implementation of its Quality Assurance Policy. Thus we are able to offer its customers consistent, safe, reliable, innovative and effective devices. The company is periodically audited to maintain system quality management. Our teams develop quality products and provide superior technical assistance. They rely on the quality management system implemented daily and that meets the requirements of ISO 13485:2003. AQUILAB is an expert in contouring and dosimetric evaluation using the software ARTIVIEW and is a partner of numerous training workshops in partnership with leading academic societies. ARTIVIEW sofware modules allow participants to perform contouring exercises of clinical cases available. Our contours and treatment plans assessment modules allow a direct comparison in interactive training session or deferred coverage on our web platform AQUILAB Share Place. Innovation is at the root of our foundation and the heart of the business. It is the main tool of our development. A dedicated team and our participation in multidisciplinary research programs allow us to maintain a technological watch and to design innovative products. AQUILAB guarantees an efficient and complete customer support for all products (software and hardware). We install solutions and train users on site. To ensure the continuity of our work, our application engineers are available to provide prompt and accurate responses to any question and requirement.